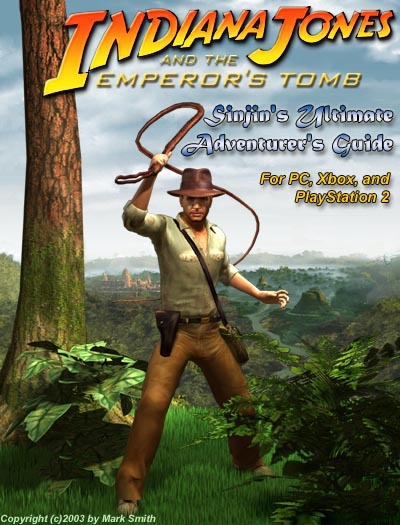 Welcome to Sinjin's Ultimate Adventurer's Guide for Indiana Jones and the Emperor's Tomb. Prepare to join Indy on his most amazing adventure yet, as you travel the world (and beyond) in search of fortune and glory. I, Sinjin, will be here to guide you every step of the way whether it be a casual hint or a complete solution. This guide has been fully tested and approved for use with all versions of the game including PS2, Xbox, and the PC. While there were no perceived differences in game content when changing difficulty settings, for the purpose of this guide the game was played on the Normal difficulty setting. Your experience and/or tactics may need to be adjusted if you are playing on the Easy or Hard settings. To navigate this strategy guide simply click on the chapter you wish to visit from the menu along the top. To return to this introduction page at any time simply click the Indy logo at the top of the page. Each chapter is fully illustrated with screenshots from the PC version of the game. These will generally give you visual clues to what is being discussed in the text. If something is not obvious I may enhance the images to note important locations or items. Due to the number of images some pages may take longer to load than others. The site has been designed to display the text prior to loading images so you can at least start to read as the pictures fill in. Controls vary between console and PC so I will not refer to specific buttons or keys but rather the command name. You can customize the controls as you see fit and substitute those buttons while reading the descriptions below. Indy can run and walk depending on how hard or how easy you push the analog stick. If you are using the PC keyboard for movement then you will always be running unless you hold down the Walk Modifier key. This is the same key that allows you to grip onto ledges and hang and drop from heights that would normally cause you damage if you simply jumped or walked off. Indy can vault onto short ledges simply by walking into them and taller ones can be climbed by jumping first then pulling up. You can also climb other objects like ladders, vines, ropes, etc. simply by walking into them. Make sure you don't jump off these objects until you have reached the top and there is a safe place to jump to. Indy can do a standing jump and a running jump to clear various pits or gaps. Some gaps are so wide you cannot make the entire jump. In this case Indy will grab the opposite ledge and then you can pull up. You can only grab a ledge if you are approaching it from a 90-degree angle. You are also free to shimmy along ledges before you pull up or drop down. This is a valuable technique in locating several secret areas. Similar to shimmying is the wall-hug move that lets you stick to any flat wall surface and sidestep along narrow ledges or between narrow openings. Just walk into a wall and press the Action button to stick and once again when you want to peel yourself off the wall and continue your adventure. Indy can drop and roll, which becomes very useful when you need to get under a low wall or tumble beneath an obstacle or traps. You can roll from either a walking or a running speed, but you will have better control if you walk and roll. Rolling also moves Indy several "spaces" quicker than any other move. This can be useful when solving some movement-related puzzles or if you need to dodge an attacker and get enough distance to manage your inventory. With some practice you can even manage to pick up an item or weapon while rolling and come up swinging. From time to time Indy will have the opportunity to swing around on ropes and chains. Make sure to take your time with these jumping puzzles and aim carefully before jumping. If your rope or chain loses momentum you can always start swinging it again. Make sure Indy is at the proper height on each rope or chain so that he can get enough arc on his swing without hitting his head on the ceiling. Indy will have plenty of opportunities to use his trademark whip to grapple and swing or even use it in combat. The whip icon will appear when you can use your whip to grapple a statue, tree, or some other object and swing across a gap. Make sure to jump from the apex of your swing to cover the maximum distance. Some swings end in a cinematic such as breaking through a wall. Doing something like this may take several attempt so don't feel pressed to complete these moves with any speed. Just like normal rope and chain swings, take your time and aim carefully. Several parts of your adventure will require Indy to do some swimming. Indy can tread water or dive and swim faster submerged. You will have limited access to certain inventory items while underwater. Don't forget to keep an eye on your air meter. When you air is gone so are you. Look for oxygen tanks that will double your air meter and allow you to swim deeper and longer. Indy will face off against plenty of bad guys during his adventure. In the beginning you will be limited to hand-to-hand combat including punching, kicking, blocking, and a grab move that can be followed with either a punch or a throw. Feel free to use anything lying around as a makeshift weapons. You can wield items like 2x4's, chairs, bottles, vases, etc. Basically, if you can pick it up you can probably use it as a weapon. Make sure to mix up your attacks to keep your enemies off guard and kick them when they are down on the ground. You can also kick guys as they try to climb up ladders or ledges. You can do additional damage by grabbing and holding onto the enemy then smack them around before tossing them aside like a rag doll. Later in the game you will start to acquire new weapons like swords, knives, and guns. Some items have dual purposes. For instance, you can fire the gun at long range or use it to smack around the bad guy up close, and your machete can slice up the enemy or slice through vegetation just as easy. Make sure to mix up your weapon attacks just like your punches for greater effectiveness. Other items like shovels, spears, and throwing knives can be carried and used but cannot be stored on your person. You may have to drop those items if you want to use something else. Indy will auto-target the nearest enemies when he is using a firearm, or you can also choose to manually target. Manually targeting an enemy will allow you to execute headshots for one-hit kills and conserve ammo - especially important for the spear gun. If you rely on the auto-target it could take several shots and additional enemies could be alerted. If you are in a crowd and using something like a machinegun you may be better off using the auto-targeting and the rolling move to dodge and attack. The auto-targeting also works for thrown weapons and items like knives, bottles, and grenades. You can manually aim these items so simply grab and throw to the nearest target lock you have. You do have a power meter that you can use to control the distance of your throw. This is useful for items like grenades but be warned that there is a short delay before the grenade detonates. Faster enemies may toss a grenade right back at you. Of course you can do the same. Weapons require ammo and there will be plenty of it lying around, either in boxes or in other weapons lying around. Collect as much as you can carry and make sure to keep your weapon fully loaded at all times. Indy will reload automatically but this takes a bit of time. Try to manually reload when things are calm. There is nothing more embarrassing or deadly than having to reload in the middle of a frenzied combat. There will be a few instances where you can to assume control over a fixed turret weapon. Ammo is unlimited in these encounters so keep the trigger mashed and watch the mayhem. Occasionally, you will find yourself underwater and forced to fight. In these situations you can only use your machete or a spear gun and spears are very limited. Make sure to aim each shot carefully using manual targeting. Some enemies like the shark will require multiple spear hits or machete swipes while other creatures like the crocodile cannot be killed. There is no shame in running (or swimming) away to fight another battle another day. With all of the fighting you will be doing it is important to keep an eye on your health meter located in the top corner of the screen. This meter will slowly deplete and change color as you take damage. You can restore your health by drinking water from fountains or your canteen or by finding and using Medkits found throughout the game. Medkits are usually hidden in crates and boxes and will fully restore your health meter. You can carry up to three of them at any time so hang onto them for those times when a fountain is nowhere to be found. Indy's canteen holds enough water to fully replenish his health meter so make sure to always keep this filled whenever you come to a fountain. Just like reloading your weapons, drinking from the canteen takes some time, so it is best to drink during those peaceful moments so you aren't fumbling around for a drink while getting attacked. Health Potion - Replenishes all of Indy's health and increases his maximum health by 50% for the rest of the level. Iron Skin - Protects Indy and lets him take less damage from physical combat. Tiger Strength - Boosts Indy's strength allowing him to do double-damage during physical combat. Prepare for more than 60 levels of action and adventure complete with Nazis, ninjas and all sorts of other evil forces that stand between you and the Emperor's Tomb. Good luck!